Written by Abbie Liehr on December 19, 2018 . Posted in Blog, News. Students in Grades 4-8 competed in the National Geography Bee in November 2018, coordinated by Ms. Rachel and Mrs. Scalici. 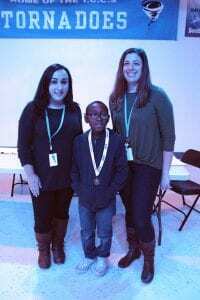 Two student finalists per grade competed in the final round on November 21, 2018 in the Cafeteria. Congratulations to 1st Place winner, Pharaoh N. (Grade 5), and 2nd Place winner, Isaac P. (Grade 8)! As our school finalist, Pharaoh will take the state qualifying exam in January to see if he moves on to the New Jersey State Competition this Spring! Good luck, Pharaoh! Harassment, Intimidation, and Bullying of any kind is not tolerated at TCCS. You can read more about this in the school's official policy on this matter. You can click here to view the the official school HIB Grade Report.